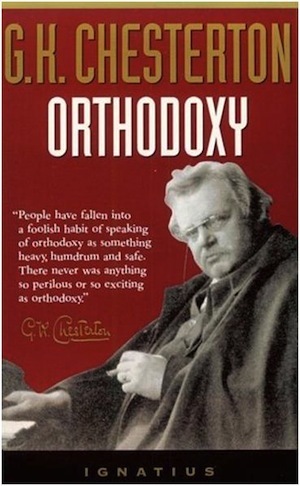 GK Chesterton quotes show up all over classical Christian education, so one of my goals this year was to read some of his works. I have already read one fiction work (The Man Who Was Thursday), so this was my non-fiction work. Orthodoxy is sometimes mentioned in the same sentence as CS Lewis’s Mere Christianity, so it does seem to be held in high regards. This was a difficult book to read. There were long stretches were it was extremely tough, and just when I thought I should give up, there were a few pages that became lucid and clear, and were well worth reading. Like finding Nirvana when you least expect it. This at least seems to me the main problem for philosophers, and is in a manner the main problem of this book. How can we contrive to be at once astonished at the world and yet at home in it? We need so to view the world as to combine an idea of wonder and an idea of welcome. We need to be happy in this wonderland without once being merely comfortable. Mysticism keeps men sane. As long as you have mystery you have health; when you destroy mystery you create morbidity. He admired youth because it was young and age because it was not. It is exactly this balance of apparent contradictions that has been the whole buoyancy of the healthy man. The whole secret of mysticism is this: that man can understand everything by the help of what he does not understand. A man was meant to be doubtful about himself, but undoubting about the truth; this has been exactly reversed. For the old humility made a man doubtful about his efforts, which might make him work harder. But the new humility makes a man doubtful about his aims, which will make him stop working altogether. The test of all happiness is gratitude; and I felt grateful, though I hardly knew to whom. An optimist could not mean a man who thought everything right and nothing wrong. For that is meaningless; it is like calling everything right and nothing left. Upon the whole, I came to the conclusion that the optimist thought everything good except the pessimist, and that the pessimist thought everything bad, except himself. Courage is almost a contradiction in terms. It means a strong desire to live taking the form of a readiness to die. “He that will lose his life, the same shall save it,” is not a piece of mysticism for saints and heroes. It is a piece of everyday advice for sailors or mountaineers. Now here comes in the whole collapse and huge blunder of our age. We have mixed up two different things, two opposite things. Progress should mean that we are always changing the world to suit the vision. Progress does mean (just now) that we are always changing the vision. We are not altering the real to suit the ideal. We are altering the ideal: it is easier. The modern young man will never change his environment; for he will always change his mind. Unfortunately, if you regard Nature as a mother, you discover that she is a step-mother. The main point of Christianity was this: that Nature is not our mother: Nature is our sister. We can be proud of her beauty, since we have the same father; but she has no authority over us; we have to admire, but not to imitate. If I am asked, as a purely intellectual question, why I believe in Christianity, I can only answer, “For the same reason that an intelligent agnostic disbelieves in Christianity.” I believe in it quite rationally upon the evidence. But the evidence in my case, as in that of the intelligent agnostic, is not really in this or that alleged demonstration; it is in an enormous accumulation of small but unanimous facts. The secularist is not to be blamed because his objections to Christianity are miscellaneous and even scrappy; it is precisely such scrappy evidence that does convince the mind. The man who lives in contact with what he believes to be a living Church is a man always expecting to meet Plato and Shakespeare to-morrow at breakfast. He is always expecting to see some truth that he has never seen before.